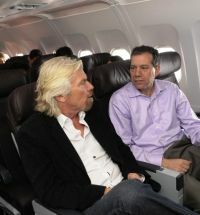 Virgin (VS) says that it is a "little" version of what is on offer with its long haul services out of Heathrow T3. In fact it is operated by Aer Lingus at T1 with VS ground staff around to make sure everything goes smoothly. For Manchester it is four times daily, Aberdeen three and Edinburgh six rotations. Virgin bid for the route when its code share partner bmi disappeared into British Airways, taking connecting passengers with it. Point to point traffic is encouraged but it is “Upper Class” clients that the Crawley-based carrier is really after. Connecting from the regions they get the use of the finest lounge on the airport, the Virgin Clubhouse. Passengers checking in at the three regional points drop off their luggage for a through flight and then are met at the Heathrow airbridge for airside transfer to T3. Northbound, luggage is collected at the destination airport but clients have to go through the Heathrow border control and then either take the ‘Flight Connection’ route or make use of the excellent Virgin ‘Revivals’ lounge for those qualifying passengers. And then make their own way across. Servisair provides lounge facilities at all the airports. It is a fine basic service, the A320s featuring the Airbus narrow aisle configuration, which make for wider seats, which also tilt. Before a 09:00 departure cut-off passengers are served a bacon roll or vegetarian offering. For the rest of the day there is a complimentary bar and ‘plane’ crisps or very nice cookies. At T1 we used APH (Airport Parking and Hotels) and their concierge parking service. It works very well, is hassle free, and price-wise competitive with parking and transfer. With the city tram service still not ready (as noted in this issue) from within a few steps of the terminal building a £6 return Express bus service (with various stops) takes you to Waverley Station in the centre of the Scottish capital. We stayed in Mercure’s Princess Street hotel with its wonderful views of the Scott Memorial, the gardens, and of course the Castle. Two nights is not enough for Edinburgh but if you have been before you can fit in visits not previously taken. BTN always recommends a hop-on hop-off bus tour, marvellous on the top deck on a wonderful summer’s day. Real live commentators too. Various routes are available from a very reasonable £13. Make it your first trip and from that select what interests you. The pass lasts 24 hours. Only London can beat Edinburgh when it comes to dining out in the UK. The choice is vast, and prices can be very competitive. Everything is available within one mile of Waverley Station. For our visit a day out of Edinburgh seemed a good idea. We choose Rabbie’s Small Group Tours, easy enough to find at the junction of North Bridge and High Street (on the Royal Mile). 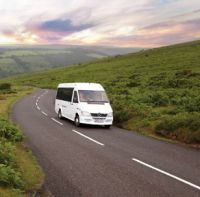 This established operator has a fleet of 16-seat Mercedes coaches and offers one and multi-day trips. With a small number of passengers the day(s) is a very sociable occasion, the driver/guide was Scottish and in a kilt. His first task was to introduce himself and then ask the same of all his clients. Ours was a mixed bag, one local, various people from the colonies and former colonies, and inevitably tourists from the Far East. Every day there is a choice of seven tours (all year round – plus a selection of longer trips up to five days – they have a London multi-day programme as well). Whilst the brochure is in a number of languages at present all the tours are conducted in English. Our choice was Melrose, Alnwick Castle (back in England) and the border town of Berwick, a nine-hour plus trip. Melrose is a lovely small market town on the Tweed, its ruined monastery containing the heart of Robert the Bruce, King of Scotland (and not to be confused with William Wallace, who lived in the same era). Here we stopped for a short rest and morning tea. Our major destination was a further one hour south, Alnwick Castle, Northumberland, home of the Percy’s for over 700 years (and also well within reach of Newcastle for a day’s outing). Soccer fans might like to know that one of the most famous sons of this family was Harry Hotspur, fearless in fight it is said, but choosing the wrong side in the Battle of Shrewsbury in 1305 (Shakespeare's Henry IV) and coming to an untimely end. Parts of the Northumberland Park area in Tottenham, north London, are still owned by the Percy family. A full day is really needed for Alnwick, on par with anything in the Kingdom as a stately home, and most of the early Percy’s seem to have met messy ends. Alnwick is the home of Duke Ralf (12th Duke) and his wife Jane. They have four grown children. The castle is very much ‘lived in’ with a 51” flat screen TV in the magnificent classical styled library. The present Duke has to be complimented with carrying on the fine work of his 18th, 19th and 20th century ancestors in restoring and maintaining the castle and its extensive grounds. Her Majesty the Queen and his Royal Highness the Duke of Edinburgh were guests and dined in the Great Hall a couple of years ago. Over 800,000 visitors a year come to Alnwick Castle, the largest employer in the locality. The State rooms, Italian influenced, are magnificent, extremely well kept and include paintings by Titian and Canaletto. Many of the artistic pieces were acquired as literally a ‘job lot’ by the 6th Duke on a European tour. The architect Robert Adam rebuilt the main entrance to the actual castle, the Lion Bridge in 1770. 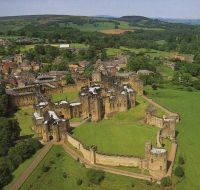 The castle is used as a backdrop and interior of Hogwarts in the Harry Potter films, which has led to an increase in public interest with Alnwick. Previous silver screen uses include Becket, Black Adder, Robin Hood Prince of Thieves and many others. The Castle offers a full programme of free events and tours, and even archery (£3 for eight arrows). A family ticket is £33 with up to four children. Adjacent to the castle, but run by a charitable trust rather than the Northumberland Estates, is the 42 acre Alnwick Garden, formal grounds set around a magnificent cascading fountain built in 2008. With the castle the cost is £61.50 for the family ticket. There are plenty of reasonably priced eating places in the castle and grounds. We made a stop at the border town of Berwick, once a thriving port but now just a quiet rural English backwater (it has changed country 13 times), and with a soccer team that plays in the Scottish League. Another last minute stop – Rabbie’s is flexible, was the tiny fishing village of Dunbar. It has a very modern indoor swimming complex if you have children to entertain. Nearby is the National Museum of Flight, with Concorde. The Edinburgh Playhouse was our outing for the evening. 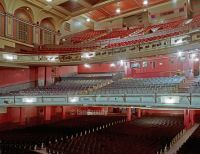 It looks nothing on the outside but is best described as opulent classical and with 3,000 seats is the largest working theatre in the UK. Dreamboats and Petticoats, a neo 1960s musical revival may not be to everyone’s taste but we enjoyed it. There are so many things to see in Edinburgh that you really need a week to do it justice. The Edinburgh Pass (£50 for three days) gives you Express Bus ride from the airport and complimentary entry to over 30 places of interest. There is also totally free access to a great variety of other venues too, including perhaps the best of the lot, the National Museum of Scotland. The Real Mary King’s Close (single £12.95) is buried deep beneath Edinburgh’s Royal Mile, a series of rooms and streets frozen in time since the 17th Century. 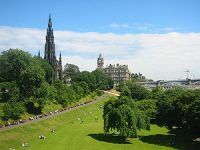 This visit is conducted in groups of 20 and can be followed up by a two-hour guided tour in and around this famous road that links Holyrood House Palace and the Castle (£9). We have deliberately not mentioned the Edinburgh Festival which this year runs from 8 August until 1 September. Book your tickets now.